In the same vein, Americans have always shared an ongoing fascination with what was for them the realm of the “exotic” in the collective imagination. Such a preoccupation with alternative experience extends to a preoccupation with pre-recorded history, as it did in the furor over the discovery of extinct dinosaurs’ first fossils. Similarly, stepping out of the familiar could satisfy the urge for both danger and wonder by contemplating the future, and the question of what might or might not exist. To this day, such a powerful imaginative force has underpinned the abundant science fiction and horror genres of modern films, including dramatic attempts at reviving and dominating massive and ancient beasts. Among the people who aimed to thrive in this deadly business, few became as famous or acclaimed as Seth Kinman. A tendency toward the eccentric is evident in many of the famous frontiersmen. The dangerous and solitary nature of such a life calling appears to require it, and the months of hardship between islands of human communication frequently creates it. Kinman, a notable early settler in Humboldt County, California, stands among the most diverse in his unorthodox frontier life. 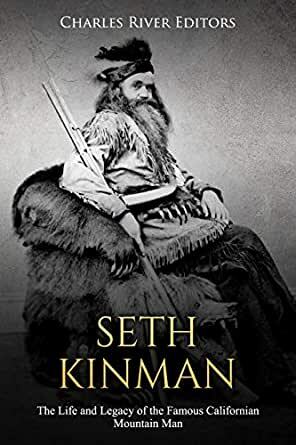 While most northern trappers were occupied almost solely with furnishing products to the European fur trade, Kinman, a more social person with eclectic skills, reveled in his associations with four American presidents and adoring crowds on the East Coast. In his time as a hunter supporting the forts and sawmills of his isolated region of Humboldt County, he also served as innkeeper, saloon owner, and a highly regarded musician. Most extraordinary of all was his work as a craftsman, fashioning novel furniture items taken from the bones, hides, and heads of his region’s most exotic creatures, most notably elk and grizzly bear. To the non-explorer, Kinman and his creations came to symbolize the grandeur and impetus of western expansion, and such a status served as the perfect engine for the federal government’s agenda and for the presidents for whom the West was an increasingly weighty issue. In his career, Kinman is believed to have personally killed over 800 grizzly bears and an untold number of elk. In what is now seen to be an environmental and social catastrophe, his prodigious “accomplishments” included the decimation of the national wildlife in his region and the wholesale abuse of the indigenous tribes in northern California.